Charles-Louis Verwee was a Flemish portrait and genre painter from Brussels who was presumably born between 1818 and 1832. His brother and father, respectively Louis-Pierre Verwee and Alfred Verwee, were respected and well known artists, mainly depicting landscape scenes. His father, a romantic landscape painter, taught him how to paint. Charles-Louis Verwee however, chose to focus on genre... Read moreCharles-Louis Verwee was a Flemish portrait and genre painter from Brussels who was presumably born between 1818 and 1832. His brother and father, respectively Louis-Pierre Verwee and Alfred Verwee, were respected and well known artists, mainly depicting landscape scenes. His father, a romantic landscape painter, taught him how to paint. Charles-Louis Verwee however, chose to focus on genre scenes and portrait painting, often depicting the wealthy upperclass in gardens or richly decorated interiors. His work reminds of that of Florent Willems and Gustave de Jonghe. 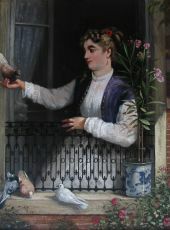 Verwee was allowed to exhibit at the Salon of Brussels, Antwerp, Ghent and Amsterdam between 1854 and 1877. One of his works was even acquired by King Leopold II for the Royal Collections.